A mob of prisoners were recently seen roaming the streets of Washington DC. But these were not any ordinary prisoners. These were participants of Amnesty International’s protest, Stand in Orange, marching from the steps of the Supreme Court to the front of the white house, clad in orange, symbolizing the uniforms of Guantanamo Bay prisoners. The protest took place on January 11, 2013 – the eleven year anniversary of the controversial prison’s opening. 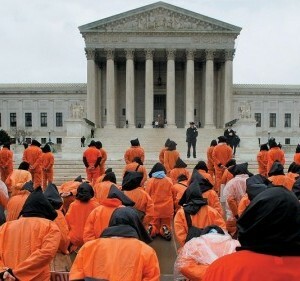 55 of the protesters wore the Guantanamo-style jumpsuits, with their heads covered, marching in solidarity with the 55 Guantanamo detainees that the U.S. government cleared for release and transfer in September, 2012. Despite the nominal “release,” all 55 prisoners presently remain in the detention camp. A large percentage of the detainees are Yemeni, which makes their release and transfer almost impossible, due to President Obama’s suspension of further transfers to Yemen in January 2010. In 2008, then-presidential-candidate Obama campaigned on the promise to close Guantanamo – a promise that is yet to be fulfilled, despite the executive order issued on his second day in office. The protest comes at a significant time in Washington, ten days before President Obama’s inauguration, to remind him of his promise. However, the issue may not be as simple as pointing a finger at the president. Congress has put forth many restrictions that have hindered progress towards the closing of Guantanamo Bay. On January 02, 2013, President Obama signed into law the contentious 2013 National Defense Authorization Act (NDAA). The bill, which specifies the budget and expenditures for the US Department of Defense, also contains restrictions for transferring detainees from Guantanamo. I continue to believe that operating the facility weakens our national security by wasting resources, damaging our relationships with key allies, and strengthening our enemies. If only Congress could feel the same.